This time of year, there is so much to think about. We’re always on the go, trying to finish our to-do list before December 25. The shopping, the cooking, the cleaning, the traveling, the entertaining. What would happen if we just stopped? For a few moments, just stood still. Paused to remember the real reason for the lights and the parties and the decorations. Are we preparing our hearts as diligently as our houses for the Christmas feast? During the Advent season, we invite you to join us on a journey through the daily Scriptures. 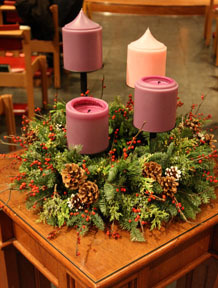 Beginning November 28, on the First Sunday of Advent, we’ll be "tweeting" a daily quote from the day’s readings. Not following us on Twitter? You can find us @redemptorists. The daily quote will be delivered right to your Twitter feed. Prefer to keep up with us on Facebook? We’ll share each day’s quote there, too. Not even sure what Twitter or Facebook are? Not to worry. Each day’s quote will also be posted on our homepage. These are short quotes. To tweet them they have to be 140 characters or less! But they’re just long enough to sit with for a few moments in our busy day, to help us prepare our hearts for the real Christmas celebration. So come along. Pray with us through this Advent season and let the boundless love of Our Redeemer, who became one of us out of love, fill your heart this Christmas.